Deep Hypersaline Anoxic Basins, or DHABs, are lakes of ultra-salty, no-oxygen water more than a mile below the surface of the ocean. They are some of the most extreme environments on Earth—and yet, life thrives there. DHABs are home to complex communities of microbes that have adapted to their hostile habitat and contribute to the global cycles of carbon, nitrogen, and other key elements. DHABs are very new to science. The first ones were found in the 1980s, and scientists are still discovering DHABs that have never been observed before. DHABs occur in many of the world’s oceans, including the eastern Mediterranean Sea, the Gulf of Mexico, and the Red Sea. The name “DHABs”—Deep Hypersaline Anoxic Basins—tells us a lot about these features of the ocean. They are depressions, valleys, or irregular bowl-shaped features in the seafloor. They range from a few hundred meters to several kilometers across, and from 10 meters to 500 meters deeper than the surrounding seafloor. They are at least 2 kilometers below the surface of the sea, and often much deeper. One consequence of being so deep is that the basins receive no light from the sun, so organisms that live there cannot use photosynthesis. Primary producers—the organisms that form the base of the food chain—rely on chemosynthesis instead. Through chemosynthesis, the primary producers use energy stored in inorganic compounds to produce sugars. Additionally, since they are so deep, the pressure in DHABs is very high. Organisms living in the Discovery and Urania Basins of the eastern Mediterranean, for example, must be able to withstand pressure that is about 350 times higher than at the surface. That can cause problems for scientists trying to bring the organisms to the surface for study. Many of the organisms adapted to such high pressure do not survive the journey to the sea surface where pressures are much lower. This means they are super-salty—up to 10 times saltier than normal seawater. This makes the water in the basin very dense, which keeps it from mixing with the normal seawater above it. Different DHABs have different concentrations of salt, and may even have different kinds of salt. Some have mostly sodium chloride (NaCl), which is what we use as table salt. Others have a high concentration of magnesium chloride, MgCl2. This is important because different salts cause different problems for living cells. In general, cells cope better with high sodium than they do with high magnesium. This means they do not contain dissolved oxygen (O2) that organisms can use for respiration. Organisms that live here are anaerobes, running their metabolism without dissolved oxygen. Some of them rely on molecules such as nitrate for respiration, and some get their carbon from gases like carbon dioxide (CO2) and methane (CH4) instead of eating other organisms or particles of organic matter. Many anaerobes will die if they are exposed to even a little bit of oxygen. This can be a problem when researchers try to bring the organisms up to the surface to study them. Many DHABs also contain toxic chemicals such as sulfides or methane, which are produced by geothermal activity or by microbes living in the basins. For example, bacteria that obtain their energy for living by using sulfates instead of oxygen (as an electron acceptor) create sulfide as a by-product. Sulfide is toxic for many forms of life, including most bacteria. But some bacteria and archaea have evolved to be able to use these substances in their metabolism. Some DHABs contain salt domes, big mounds of hardened salt. These may contribute salt to the DHAB brine. 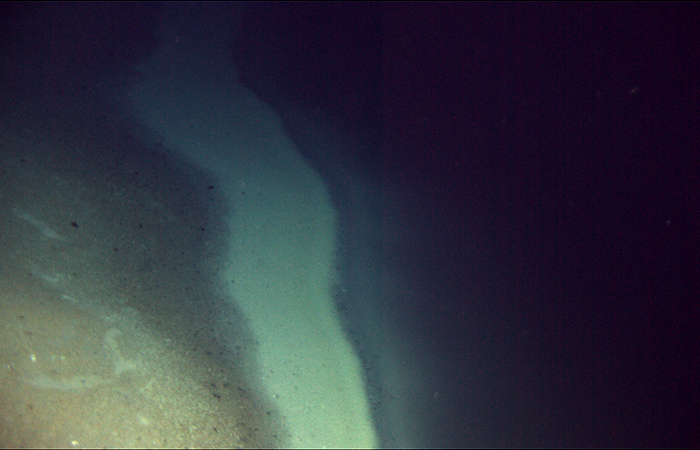 In some DHABs, methane and other gases collect in reservoirs beneath the seafloor. The gases can percolate upward, pushing up domes of sediment at the seafloor that are called mud volcanoes. The gases can burst through the soft sediments, creating "mini-eruptions" of wispy columns of sediment-filled water. We didn’t even know DHABs existed until the 1980s, and life wasn’t found in them until the 1990s. Many—perhaps most—of the organisms found in DHABs had never been described by scientists before. These organisms contribute to the cycling of carbon, nitrogen, sulfur, and other key elements in the Earth system. They can also tell us a lot about the very first forms of life on Earth. Most biologists agree that life probably arose in environments that had little or no oxygen, and that may have been hypersaline, as well—in other words, environments much like a modern-day DHAB. When we study DHAB microbes, perhaps we will see what very early forms of life looked like and how they lived. DHAB organisms could also tell us something about extraterrestrial life. Hypersaline, low- or no-oxygen environments occur on other planets and moons. Could they be populated by microbes that resemble the organisms in DHABs? By expanding our understanding of how living things tolerate the extreme conditions in DHABs, we will have a better idea of where life can occur—and where we should look for it.